It’s no secret that moving is stressful, from finding a new place to settling in and everything in between. The actual physical process of moving your stuff from one place to the other can be the biggest drag of all, and it’s definitely the least fun. 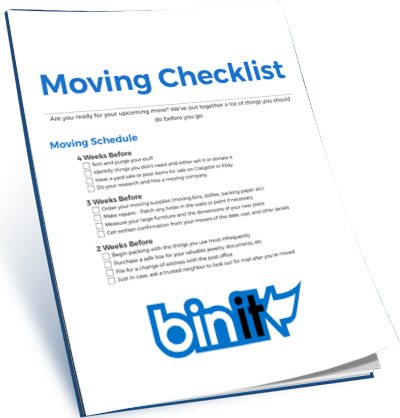 When you Bin-It, you save hours of strain and frustration. We show up with stackable plastic bins, ready with labels for easy labeling. You pack them up and swiftly close the attached lids. Once you're done, we'll come help you move and unpack into your new and beautiful home. And you’re done!